The oil story has been covered quite extensively this week as oil prices have spiked up and over $105 a barrel for the Texas Sweet stuff. If you’re tired of this story, too bad. It’s important because it just may guide the direction of the market if the trend shifts and set up more opportunities. You may be thinking, “God, doesn’t MarginRich ever write about positive economic topics. It’s always glum, glum, glum!” And that is because I call the markets how I see them. I’m not a perpetual bear; just a trader trying to get a sense for the macroeconomics and speculate accordingly. You want some happy stories? Here’s some YTD returns from some top performing ETF’s. Biotech is absolutely killing it this year and you could have skipped the hassle of cherry picking a winner and bought the iShares Biotech ETF of IBB for a 40% gain since January 1st. Don’t like biotech? How about riding the return of the consumer with the SPYDER Consumer Discretionary ETF of XLY for a 26% gain; or an even safer play was simply riding the demographic wave of the baby boomers into the Healthcare SPYDER offering of XLV, also for a 26% gain. There are positives stories to recognize and quality trades to celebrate, but the problem is that there is always danger lurking around the corner and that is what I’m constantly focused on. I’m forever listening for the sounds of a monster under the bed or hiding in the closet. 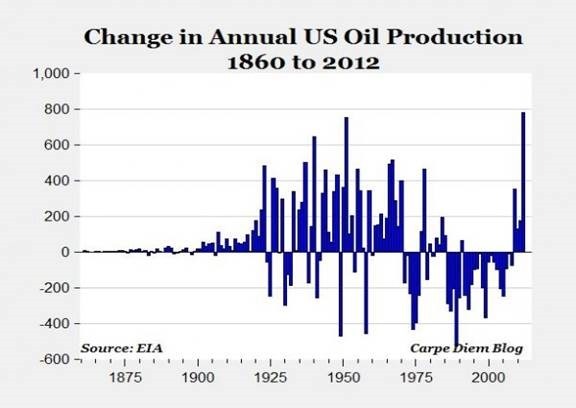 Getting back to petroleum…so what are some reasons for the spike in oil? Why even bother with this question? We could falsely attribute any number of causes as if there is a legitimate correlation. Syrian civil war. Egyptian Coup…again. Summertime road travel in the US. Oil tanker train crash in Canada. Full Moon on June 23rd on a Sunday right before the upward ascent in oil began on June 24th combined with planet Mercury turning retrograde on June 26th confirming the petroleum uptrend off of the action of the Full Moon. Those are legitimate astrological events and dates by the way…for real. Doesn’t exactly paint a picture of an environment in which oil should be spiking. The supply & demand fundamentals simply don’t jive. 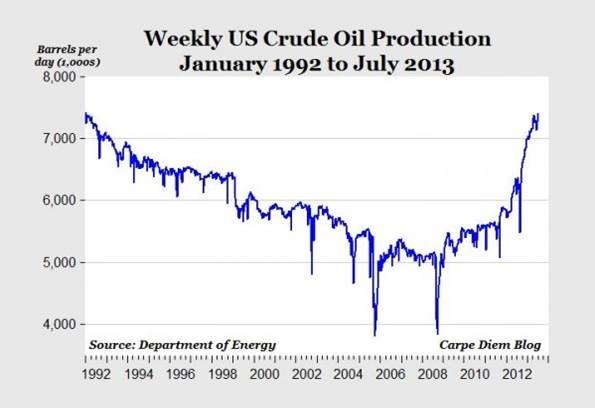 America is essentially swimming in black gold and speculators have ran up the price. I know, I know. Evil speculators are always getting blamed when energy prices rise, but this time it really does appear to simply be a matter of speculators hopping on the trend and running up the price. Fortunately, the Commitment of Traders (“CoT”) reports for oil are potentially foretelling of a turn in the price and possibly erasing the returns of this latest run-up. 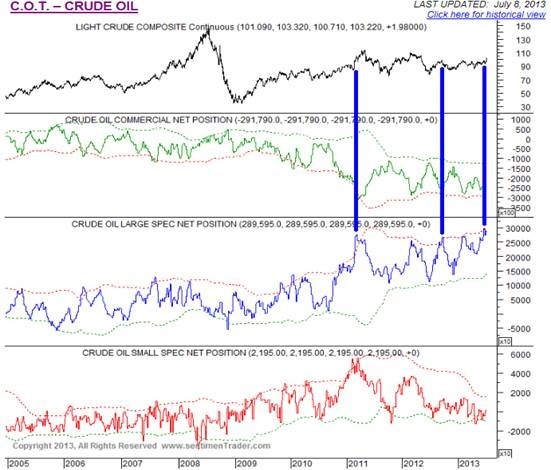 Take a look at the CoT for the Large Speculators and what it has meant for the oil price each time the Large Specs. crossed the top red line of the envelope, which is denoted by the blue bars in the first chart. The chart below it shows the action at a closer level. It would appear that some relief from the high oil prices may be on the horizon, although anything is possible in today’s markets. We know they’re all rigged. Energy is especially important because it truly has the power to bring down the national economic fundamentals quite easily. Even if oil prices do come down, gasoline prices tend to have a 30-day lag so we may still have to deal with a spike at the pump as inventories get worked off. 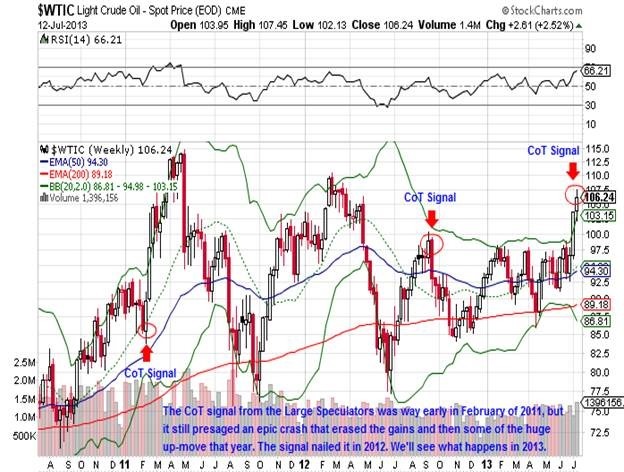 And if oil prices stay elevated, then forget about it. Oil prices staying elevated for an extended period has the strong potential to lead to a total stock market contraction, which can adversely affect several asset classes across debt and commodities. The last thing the nation can afford right now is a $4.00/gallon national average at the gas pumps. You can see the 30-day lag in action in these two sets of charts. 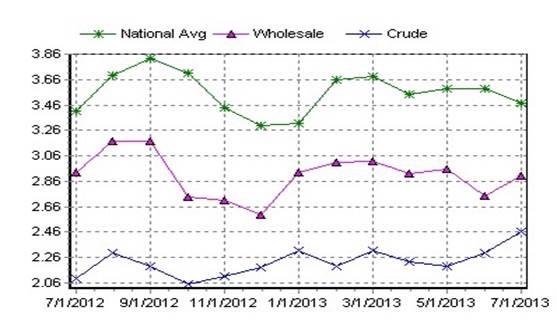 The first is courtesy of ZeroHedge and the second is courtesy of AAA, yeah the driving club, which tracks gasoline prices closely and their chart very clearly marks the lag as well. The reason this is so important is because the economy really appears fragile right now. There’s no true strength. Sure there are pockets of growth and the stock market has had a great run. And if you go by all the tried and true indicators via the government and some universities, then America is definitively growing. The dollar too has been relatively strong. But nothing is at it seems. If things are truly looking up, then why do the following two charts even exist? 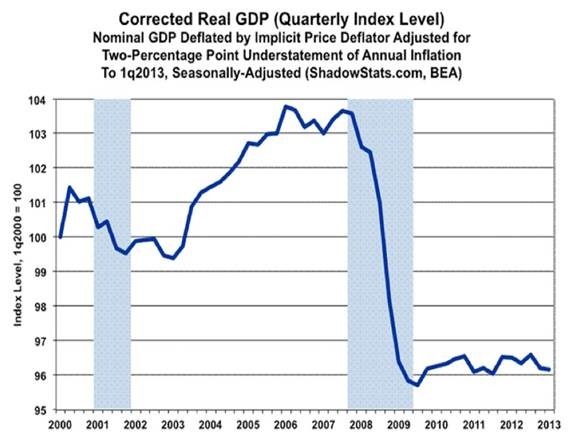 The first chart, courtesy of ShadowStats, clarifies the true economic “expansion” of the US since the downturn. I call that “expansion” for what it is…a bunch of bologna. 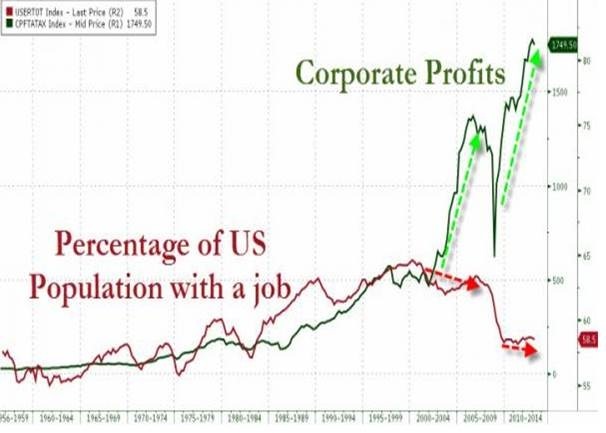 The second chart, courtesy of ZeroHedge again, depicts corporate profits of the S&P 500 and the absolute zero effect it has had on employment. Many of the profit gains have come from these major corporations downsizing and reorganizing, squeezing more profitability out of the labor force that remains. CapEx has fallen off the face of the earth. No corporation wants to risk investing in large-scale growth initiatives(there are of course exceptions) because they can see the writing on the wall just easily as the next economist or speculator or two-bit blogger who thinks he or she knows something. Judgment day is coming. Financial profits represent the largest component of that profitability of the S&P 500 and we’ve all seen the banks cut jobs by thousands at a clip over the last few years. Additionally, those hack institutions wouldn’t even be reporting profits if it wasn’t for the reserve releases they keep drumming up on their quarterlies. The banks are flush with free cash courtesy of the Fed to reserve against their ridiculous amounts of liabilities on and off the balance sheets, and these clown fish release the reserves every quarter to drive the bonuses of the top players. What a racket! There is of course the recent bright spots of reported “job growth” in America, which is completely laughable. Non-farm payrolls increasing due to an increase in part-time burger flipping and serving jobs ain’t legitimate job growth by any measure for any enlightened person. 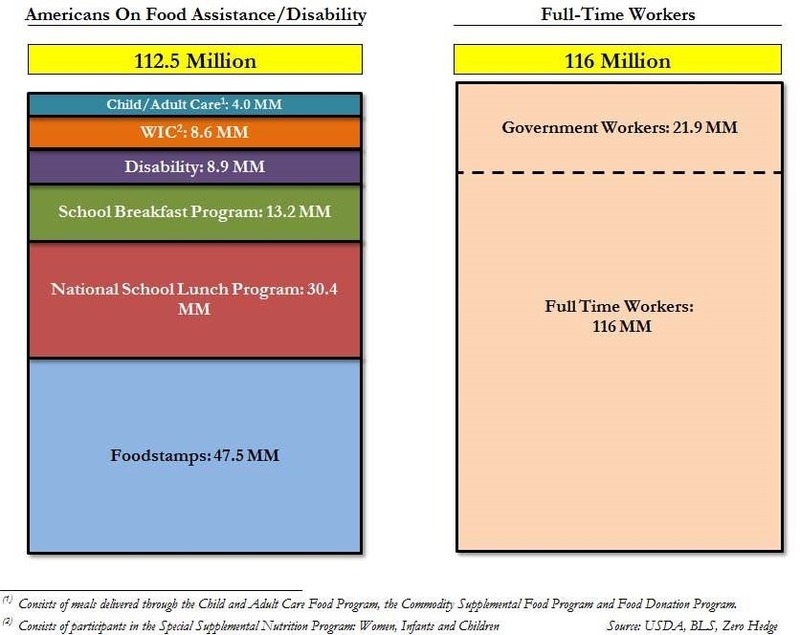 What a complete manipulation of the data to produce propaganda to make the great unwashed feel better about employment. A cursory glance behind the curtain shows exactly what is going on with the job market. 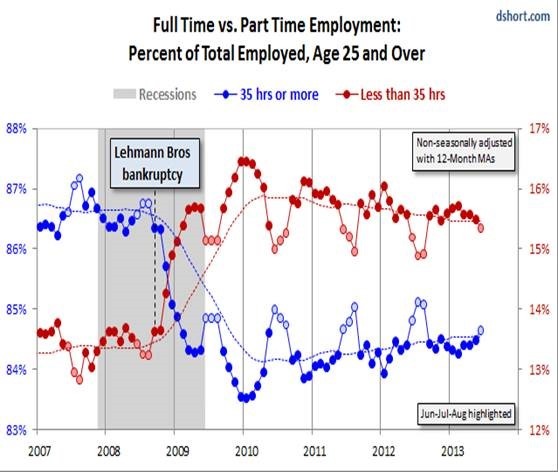 People who used to possess full-time professional positions that have given up looking for full-time work and simply work 1, 2, or even 3 part-time jobs now, will tell you that it’s not really getting better out there. And more importantly, they can’t afford $4.00/gallon to drive to their jobs taking orders at Fast Food, Inc. during the day and Sell You Crap Corp. at night to stock the shelves. Observe the following two charts. 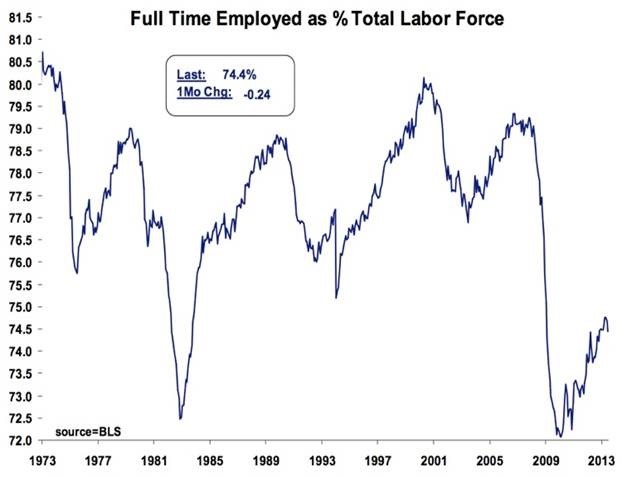 One, courtesy of Eric Pomboy via KWN , which shows the Full-time work force as a percentage of the total US labor force. One word…laughable. You’ll find that word comes to my mind quite often regarding US economics, world banking, and government reported info. The second chart, from Doug Short, supports the sad state of the rise of the part-timer; which is what our government claims is the rise in NFP’s. Short’s site is terrific, so stop by for some very interesting visuals. Coming full circle, oil prices have the potential to push the economy to contract at a time when the US or the world for that matter can least afford it. 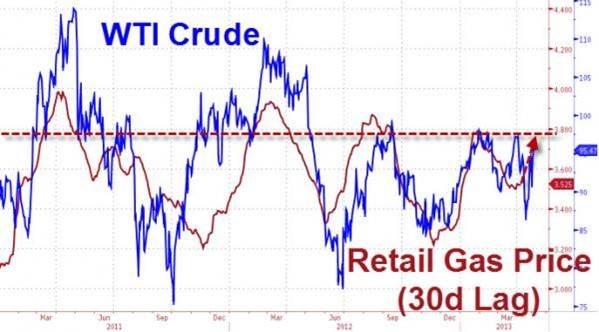 I suspect that a turn downwards is coming for the price of oil, but nobody can predict definitively. Do I have a trade for the reader to capitalize on the potential moves in oil, gasoline, or the markets? Nope. I have trades set-up for myself, but this note is to specifically point out the dynamics in the oil market and the very plausible reactions that could occur. If you have some favorite oil related names on a watch list, I would keep a close eye. A take-down in oil may present a very favorable entry point which could generate a nice pop for the year as I still think the equities markets finish out 2013 fairly strongly.